It's a great idea to add some stunning morphing effects to a movie and burn it onto a VCD or DVD. Just note these points below. First, set a correct movie size. 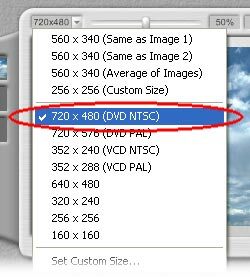 You should choose the "720 x 480 (DVD NTSC)" for creating a DVD in NTSC system, or "352 x 288 (VCD PAL)" for creating a VCD in PAL system, etc. Second, set the AVI speed to 29.97 fps instead of the default 15 fps in the Export window. Note, the 29.97 fps is for NTSC system, you should set the AVI speed to 25 fps for PAL system. Last, export the morph as AVI format. It is recommended to export uncompressed AVI files. Just make the "Export Compressed AVI" unchecked or you should choose the compressor "Full Frames (Uncompressed)" if the video codec choosing dialog pops. You can also export the morph as compressed AVI by some codecs like the DivX codec. 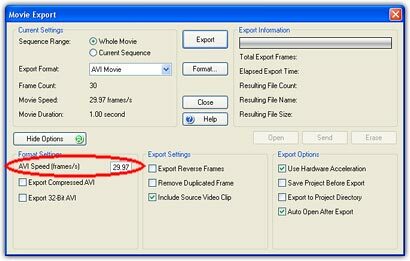 Learn more about "How to Export Compressed AVI". Now, you can import the exported AVI file into video editing software or burning software to make a VCD or DVD.